A latitude of acceptance is when you have a preexisting tendency to accept an idea. A latitude of non-commitment is when you have no preexisting thoughts on the matter, thus no leaning towards acceptance or rejection. A latitude of rejection is when you have a preexisting tendency to reject an idea. I also taught (and graded papers for) business and professional communication at UCF for 7 years. My experience as a teacher steers me toward the holes in Mrs. Peace’s research and drives me to find support for her declarative statements. When I can’t find that support, the declarative statement loses it’s meaning. I’m also struggling to figure out how to explain myself without sounding like I’m a heathen or that I think I’m exempt from the Bible’s instructions. I promise I’m neither. I just believe that if we, as humans are actively involved in a close, personal relationship with Jesus Christ and we actively seek to know and live within His moral will through the wisdom found in His Word, we will actively strive to live our lives in a way that is pleasing to Him and that glorifies Him. That “way” often looks very different from person to person, from marriage to marriage and from family to family. I believe “different” isn’t “wrong” – if it’s within the moral will of God. If someone doesn’t agree with my point of view, I don’t perceive them to be “out of the will of God” or sinful. I believe it’s okay to agree to disagree. I believe Christians have more in common than not. I want to focus on the stuff we have in common, rather than debate the few things we may see differently. If we spend time in prayer, not only talking, but “abiding” then we will have a peace and understanding of how we are to order our lives. To come back to the topic of this chapter – and this book in general, we do need to be confident that the way we conduct ourselves as Christian wives is supportive of our husbands. We need to be confident that our husbands feel respected, needed and appreciated. I just don’t always agree with Mrs. Peace on how I should accomplish that. At the end of the day, it’s my HUSBAND’s opinion as to whether I’m accomplishing those goals that’s important to me. For instance, it’s Memorial Day. FirstHusband isn’t on travel and he isn’t at work. He’s making pancakes. Right now. While I’m sitting on the couch typing this. Let me ask him why he’s doing that. L O N G pause. See how pointless this is? He’s making pancakes because he wants to. Sometimes a guy just isn’t all that deep. Does the fact that he’s cooking while I’m sitting mean I’m not exemplifying an “Excellent Wife?” What about the fact that he just brought me a cup of coffee, creamed and sweetened just the way I like? What does that mean? In our house, it just means that he was already fixing himself a cup and it was no big deal. He wanted to do something nice for me. Sometimes guys just aren’t that deep. 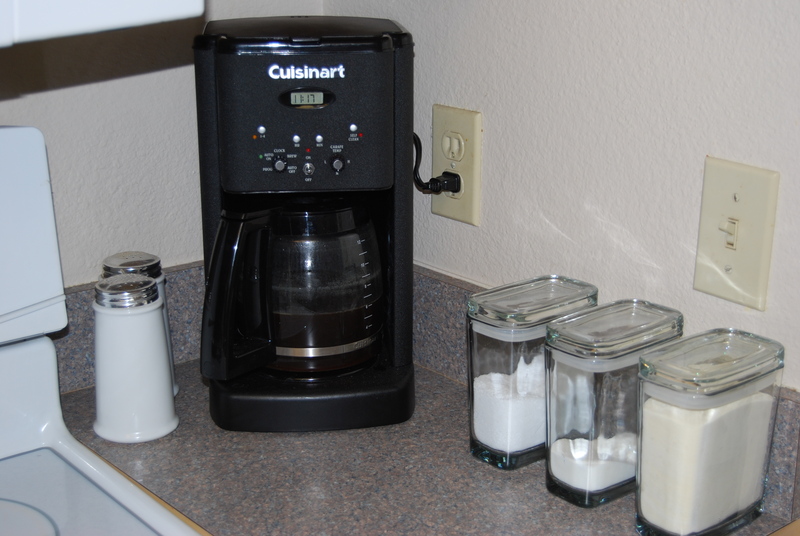 Now, he did use the coffee pot I picked out. (Thanks for the referral, Lisa Writes!) He got the creamer and the sweetener out of cannisters I picked out and placed in their current location. I picked those particular cannisters and placed them in their location in an effort to be organized and make them convenient. Using the Underwear Principle, I actually created a coffee “station” with all the supplies needed for coffee located in one spot. I did this for him. For me. For us. At the end of the day, I’m me. I have to live with me. I have to live authentically. For me, that means I have to go back to the Bible on all this. I’m seeking Biblical wisdom. I’m learning. I believe this book is prompting me to learn. What I’m doing here is documenting my learning process, probably more for myself than for anyone who happens upon these posts. So, fully aware of my latitude of rejection, here goes. Chapter 8 begins with a description of two very different women, Tracy and Stacy. Two polar opposites. Both examples are extreme. Tracy sounds like a “pleaser” who can’t say no because she desperately wants people to like her and she’s probably headed for collapse due to exhaustion. Stacy sounds clinically depressed and should go to the doctor for a full physical exam. The thing is, in my circle of friends and acquaintances, most of the women I know don’t fit in either example. Most of the women I know are significantly more balanced than either of these women. I personally can’t relate to the examples. I don’t identify with Tracy or Stacy. So, if Mrs. Peace is saying that Christian wives should NOT be like either of these women, then check. I’m good so far. Still okay. But I can substitute “godly wife” with “good wife” and still agree. Here’s the thing. I probably agree with that. If we define it the same. But do we? To what extent is “the home to be the wife’s domain?” To the exclusion of what else? This is the crux of it for me. To the exclusion of what else? As Biblical support for her statement, “God has always intended for the home to be the wife’s domain.” Mrs. Peace quotes only the “verses that pertain to the home” in Proverbs 31. She says that “out of twenty two verses, nine refer directly to her work in the home.” Less than half. She works hard and enjoys her work. I can’t find anything to indicate this refers “directly” to her work in the home. This is straightforward. She buys a field and plants a vineyard. I really don’t understand how this is “directly” related to work at home. It sounds like she’s an entrepreneur. Unless the vineyard is near her home and the grapes (and wine?) will only be consumed by her household and not sold. In my understanding, this verse doesn’t relate “directly” to her work at home at all. This part of the verse definitely doesn’t seem to relate “directly” to work at home. Checking out “profitable” or “good,” the Hebrew word is “towb” and there are just too many synonyms to type. and then there’s text I can’t type due to keyboard limitations, followed by a reference to 1 Kings 11:36, “that David my servant might always have a lamp,” i.e. that his race might continue for ever; and notes to compare its use to 1 Kings 15:4; 2 Kings 8:19, and 2 Chronicles 21:7. Figuratively? I never read that “figuratively” before. I took it literally. Lamp. Candle. Didn’t go out at night. Interesting. Totally NOT what I thought. Very cool! Thanks to Mrs. Peace again for prompting me to look up each word in this verse – even the part she omitted. Unfortunately, her application of this verse – that it refers “directly” to a woman’s work at home – isn’t supported. This one seems pretty straightforward and let me just say, THANK YOU to Samuel Slater. ewwww. I really didn’t need to know where the dye came from. But here she takes care of her family’s wardrobe. DIRECTLY related to her work at home! She dresses well, and makes her own clothes. I can’t sew. I do not believe my inability to sew means I’m failing my family or God. When the literal translation doesn’t fit today’s culture, I look for intent. My clothes look nice, they fit and they are reasonably priced. I just buy my clothes instead of make them. Often second hand or at Ross. So is this verse “directly” related to the Proverbs 31 woman’s work at home? Sure, why not? I don’t understand how this is “directly” related to her work at home. She’s an entrepreneur. DIRECTLY related to her work at home! So I found three verses, not nine. But I learned that I need some maidens and was reminded that my prosperity is not short-lived. Good Bible study. Overall, time well spent. “The excellent wife’s home-based ministry does not apply just to King Solomon’s day, but to our day, as well. The Apostle Paul wrote to Titus about this very issue. Then Mrs. Peace gives some Biblical support! She notes that “worker at home” is translated from “oikourgos” and says that the word is derived from two root words, “oikos” which means “a dwelling, a home or a household” and “ergon” which means “to work or be employed.” But www.blueletterbible.org says that the second root word for “oikourgos” is “ouros.” Not “ergon.” So I look up both. ergon does mean “business, employment, that which any one is occupied” but is it a root of oikourgos? So I’m confused. What is she saying? How does “ergon” fit with “guards the dwelling?” She used one definition and supported it with the meaning of another. Did I mention I was confused? “urgos” is the word I want to understand. Some sources indicate it is a form of “ouros” i.e. “keeper,” – which more accurately means someone who is watching over something or being a guardian. I understand that the Bible COMPLETELY reveals the moral will of God. I get that. But there’s a problem. For like . . . EVER, people have been using passages to support their premise and point of view. There will ALWAYS be disagreement, even among Christians, as to the specific directives found there. So which translation is correct? A FORM of the word or another word from which it is DERIVED? This is why I will never go to seminary. “Oikourgos is a compound based on the word oikos, “house”. It is translated as if it was a noun (many Greek nouns end in -os). However, the -os noun ending is masculine. Since in this context it is referring to women, the masculine ending would not be correct. Therefore we know that the word is not a noun. Instead, the ending is actually a different suffix: -os in its usage as an adjective-forming verbal suffix. The KJV translators saw the word oikourgos as a noun, and since it was describing a person, they took it to mean a certain type of person. Since oikos means “house” and urgos (a form of ouros) comes from a root meaning “to keep”, they translated it in the KJV as “keepers at home”. Oiko-, as you should remember from the above explanation, means house. The form -urgos, a form of ouros, means “to keep”. In the case of compound words, it means “taking care to keep something (in good condition)”. The entire word, oikourgos, then means “mindful (or careful) to keep their houses in good condition”. You decide for yourself. As for me and my house? I’m going with “ouros” and I’m going to be mindful to keep my house in good condition. Forgive me if I don’t track down the meaning of “oikodespoteo” as Mrs. Peace uses it with regard to keeping widows of trouble and preserving their reputation. I’m just too tired. ” . . . but I do believe that God intended for the women, especially the younger women, to stay home and do a good job of caring for their homes and for their families. A wife who is gone with too many activities or work does not have the time nor energy to keep her home as it should be kept. It’s the declarative statement I’m having trouble with. Staying at home and organizing a clean, well run household is a major biblical emphasis in the God-given ministry of the wife? “Major biblical emphasis” is some fairly strong language. Are the verses she quotes here the “major biblical emphasis” which support this statement? I don’t see the connection. Doesn’t the “God-given ministry of the wife” include raising her (and her husband’s) children? Then Mrs. Peace throws out a question. Why is the assumption that a man without a job is “irresponsible” or “lazy?” There are other possibilities. He might be an excellent family manager and caregiver to their children. What if she had a higher earning power? What about “unless the wife can show him that she would be sinning by working?” How would she do that? This is the most disturbing part of the answer for me. That she should “take advantage” of the “biblical resources” God has given to protect her. Is this using the Bible as a weapon? As a tool to manipulate? That’s a fine line I don’t want to walk. Christians have been using the Bible – in and out of context – since forEVER to prove their point. (Did I say this before?) Each side using words like Mrs. Peace uses when she says, “Common sense would dictate . . . ” The problem is that my “common sense” doesn’t lead me to the same conclusions as Mrs. Peace. Now what? What happens when a husband and wife come to different conclusions? What if the wife believes she is sinning by working and her husband doesn’t? She should submit? But she should live in sin? In Chapter Two of Excellent Wife, Mrs. Peace says God’s authority overrides the husband’s authority. This reasoning is a circle. I’m going to skip the part where Mrs. Peace believes the church has a responsibility to help a woman to be able to stay at home with her children if her husband were to die. In today’s culture, that’s not the norm. Finally, there’s the “Lazy Person” vs. “Self-Disciplined Person” comparison chart on page 75. If you recognize yourself as a “Lazy Person” make an appointment with your doctor as soon as possible. Make sure you are physically and mentally healthy. If you believe you may be a “Perfectionist,” please consider counseling. Whose expectations are you trying to meet? Are you a product of “conditional” love? Before you assume sin, rule out health related possibilities. Lazy? Perfectionist? Maybe. Maybe not. ← am I thinner when I’m invisible? Again, my thanks for the time you’ve taken to parse out these words and meanings. I find myself convicted all over again through the readings and discussions of this book–which I’m not even reading right now. Having spoken with Mrs. Peace on some of these things, I know that in her nouthetic counseling she deals with the extremes of our understanding in both cases–the woman who is the doormat and the woman who is the proverbial boss of the hoss. Therefore, to some degree her writing is meant to correct the extremes of our culture rather than those who have long before and continued to submit themselves to Biblical direction. That being said, I agree with you still that the value of her instruction comes foremost from comparing it to Scripture and discussing it with Husband. Please keep on, I do appreciate your posts.